Jennifer and David have got to be in the top ten list of the most fun couples I’ve ever had the pleasure of working with in my 30 year career as a professional wedding and portrait photographer. I’ll never forget the trip we made with their bridal party to Cedar Beach in Mount Sinai, NY for photos. A number of their wedding pics appear elsewhere on this site, including one of Jennifer reclining, in her beautiful wedding gown, on a rugged rock jetty at waterside. This image was captured at their reception venue, The beautiful Hamlet Willow Creek in Mount Sinai, New York. 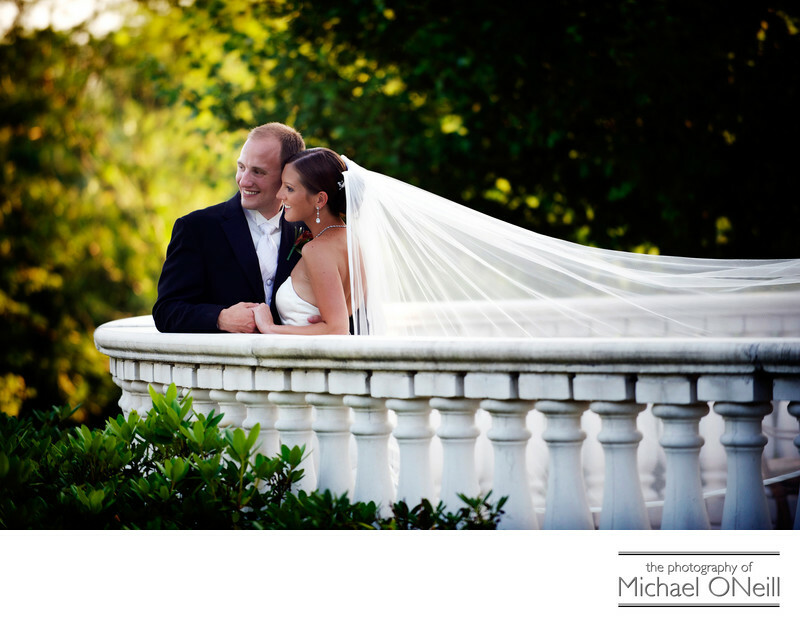 This romantic spot is at the back of the building overlooking the golf course. I loved the way the bride’s cathedral veil flowed behind her as the couple looked off into the distance. I have the privilege of being one of the recommended house vendors at The Hamlet Golf and Country Club in Commack, NY; home of the former Hamlet Classic tennis tournament. These two venues, plus The Hamlet Windwatch, make up the trio of catering venues operated by Club Corp. on Long Island. If you are planning a Hamlet Wedding celebration, or if you want to have a ton of fun with your wedding photographer at the venue you choose for your big day, give me a call. I’d love to be trusted with the responsibility of creating photographic memories to be enjoyed by you, your friends and your families for years to come.